Witness bottlenose dolphins frolicking in their natural habitat, then cruise to the backcountry for some snorkeling fun of your own! It’s a trip of a lifetime for nature enthusiasts, combining some of Key West’s best water experiences. With the only Dolphin SMART designation in the Keys, we ensure responsible dolphin observation. Confirmation will be received at time of booking. Check-in is 30 minutes before the departure time. A valid Government issued photo I.D. is required to check-in. Why Wannado Tours Is the Right Choice? For a full refund, cancel at least 48 hours in advance of the start date of the experience. Climb aboard our Key West Dolphin Watch & Snorkel Tour for an aquatic journey to observe the grace & beauty of our resident Key West dolphins. Take our fast powered catamaran on an adventure into the shimmering turquoise waters of the Gulf of Mexico. Together, we’ll responsibly watch bottlenose dolphins as they swim, play, feed and do what comes naturally. Then, we’ll head to the Key West wildlife refuge where we’ll snorkel along the shallow backcountry. We are the only company in the Florida Keys to have the prestigious “Dolphin SMART” certification – a National program that protects and promotes the responsible observance of dolphins. After a day on and in the water, we’ll begin our ride back to the dock. Enjoy complimentary cold beer and chilled wine on our morning and afternoon trips. No, we do not provide parking at any of our check in locations, but you can use street parking, pay to park lots or parking garages.. IF I HAVE PAID FOR MY TICKETS, WHY DO I STILL NEED TO CHECK IN? ]Yes. It is necessary for us to collect your paid in full voucher and give you a boarding pass. This helps us maintain an accurate count for the coast guard..
CAN MY CHILD WHO IS UNDER 18 YEARS OLD GO ON A TRIP BY THEMSELVES? Children 15 years old and younger must be accompanied by an adult. Children 16-18 may go on our Dolphin Watch trip unaccompanied, but only if they have a valid photo ID..
HOW MUCH TIME DO WE GET FOR EACH ACTIVITY? 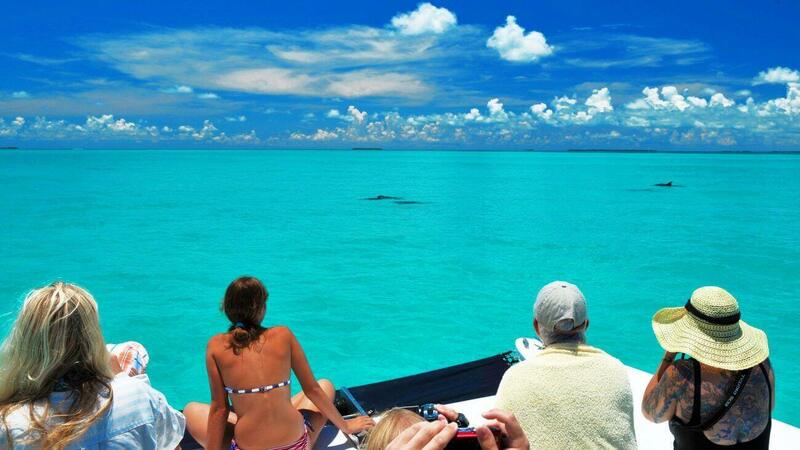 You will get to dolphin watch for one hour and snorkel for one hour..
ARE WE GUARANTEED TO SEE DOLPHINS ON THE TOUR? No, cannot guarantee that we will see dolphins, but we do have a 98% success rate of seeing dolphins on all of our dolphin watching tours. This is because the dolphins are non-migratory. They are in Key West year-round and our captains are very familiar with where to find them..
DO WE GET TO SWIM WITH THE DOLPHINS? No, the dolphins that we are viewing are wild. We will watch these protected dolphins in their natural habitat. .
WILL WE BE SNORKELING AT THE REEF? We will take you the Gulf of Mexico on this trip. You will snorkel Shallow Reefs with the possibility of Spotting Stingrays, Juvenile Fish, Sea Fans, Sea Rods, Sponges, and Isolated Coral Formations. . Yes, mask, snorkel, fins and buoyancy compensator vests are provided..
CAN I BRING MY OWN SNORKELING GEAR, IS THERE A DISCOUNT IF I DO? Yes, you are more than welcome to do so, but there is no discount. .
DO YOU OFFER PRESCRIPTION MASKS? No, but they may be rented from local dive shops. .
Wetsuits are available for a fee of $10 per suit (cash only). .
DO YOU HAVE UNDER WATER CAMERAS AVAILABLE TO US? Yes, we sell disposable underwater cameras at our check in locations..
ARE THERE LOCKERS ON THE BOAT, WHERE CAN I KEEP MY BELONGINGS? No, there are no lockers, but you can bring a small bag and leave it where you are sitting on the boat..
IS THERE SHADE ON THE BOAT? Yes, there is a small portion of shaded seating on the Dolphin Cat; however, It is a very good idea to wear sunscreen and sun protective clothing..
We do not operate in unsafe weather conditions, but a light rain shower is not a deterrent. The Captain will assess the weather and should the Captain determine that the conditions are unsafe to run the tour, the tour may be postponed or it will be canceled. If a trip is canceled by us for any reason, every effort will be made to reschedule the trip during your stay in Key West. If you are unable to reschedule, you will have the option of receiving a voucher for a future trip or receiving a full refund..
© Copyright 2019 | All Rights Reserved | Website Powered by: BMN Infotech Pvt. Ltd.